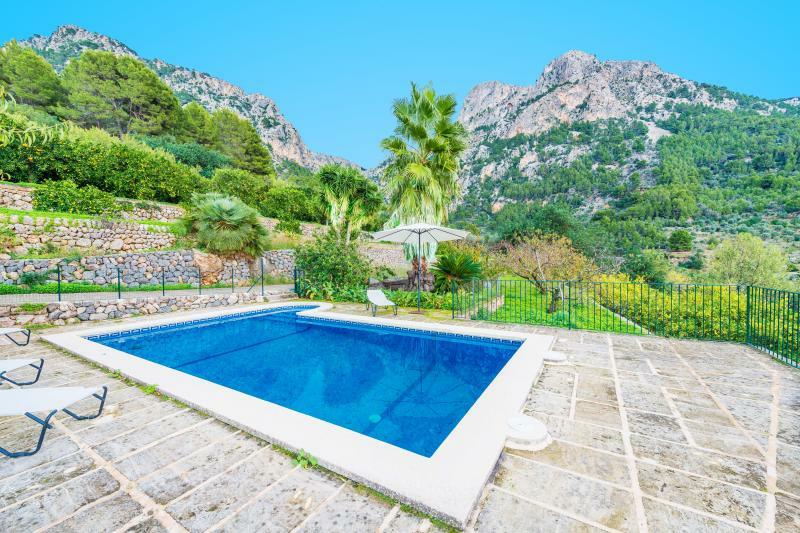 This cottage lies in one of the most amazing settings in the midst of the Tramuntana mountains, in Biniaraix, western Mallorca and welcomes 6 people. 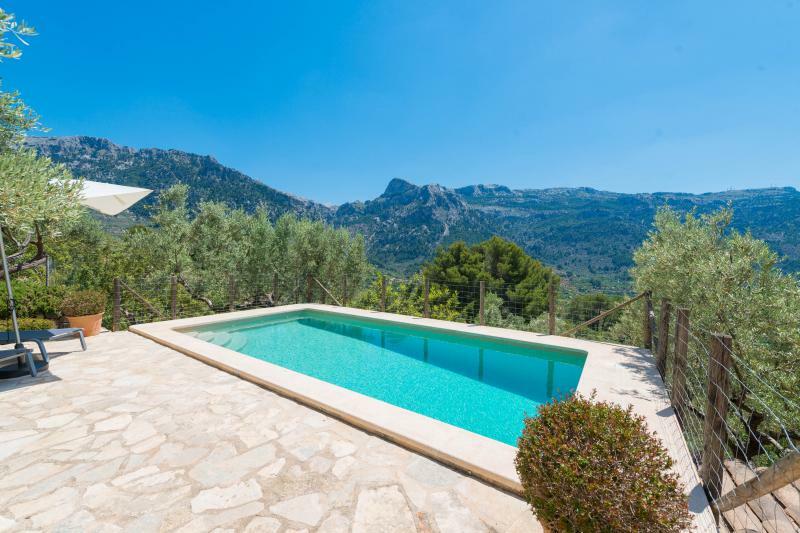 This dapper villa is set in a dreamlike location, surrounded by the mountains and features a cool, 8 m x 4 m chlorine pool with a depth ranging from 1.4 m to 1.9 m. By the pool, you can lay back on one of the six sun loungers and enjoy a lazy afternoon or have a sumptuous dinner on the terrace. The plot is fenced and has a garden with orange trees and depending on the season, you will be able to enjoy fresh juice. 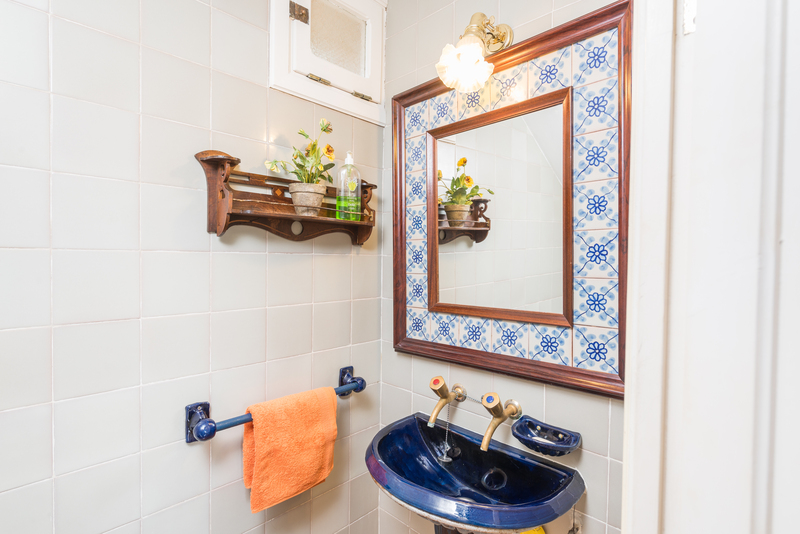 The interiors are decorated with rustic elements softened by mellow colours. 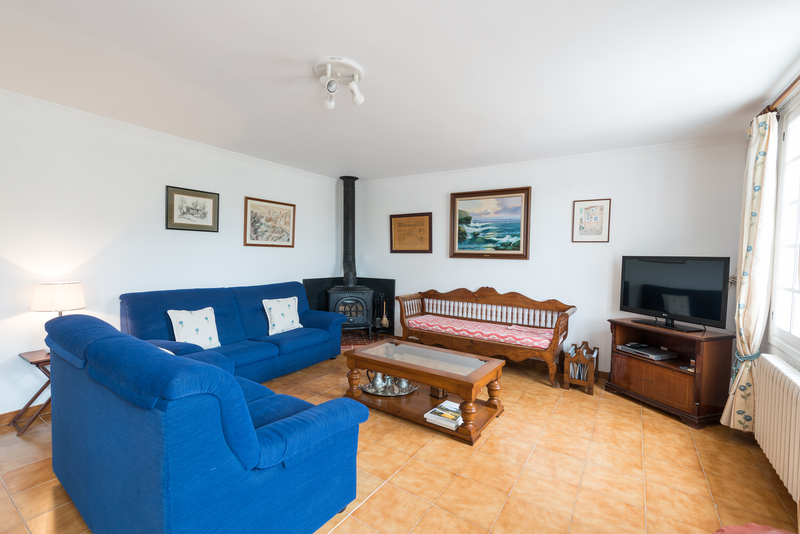 The sitting room has a romantic fireplace and satellite-TV. The kitchen with gas-stove leaves nothing to be desired. 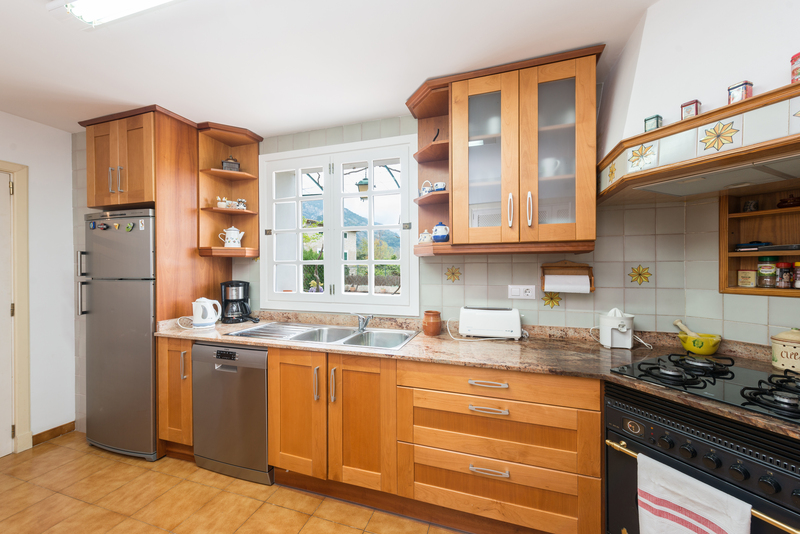 Next to the kitchen, there is the dining room, a comfortable space to enjoy meals. 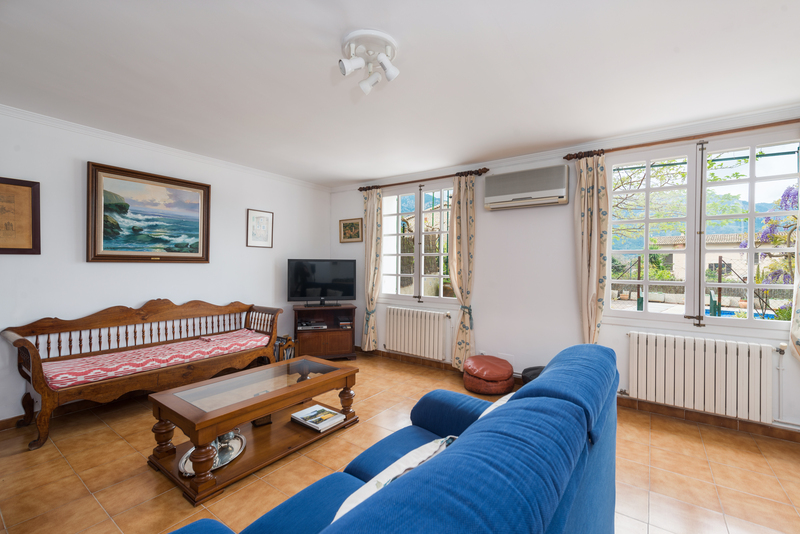 This room gives access to the laundry with washing machine, iron and ironing board. There are two double bedrooms and one twin bedroom on the first floor. 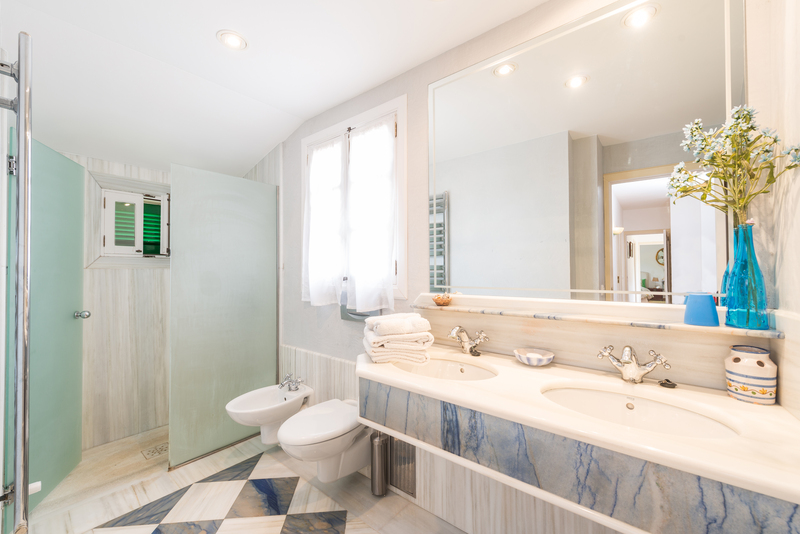 Regarding the bathrooms, there is one toilet on the ground floor; a bath with bath tub and another with shower on the first floor. 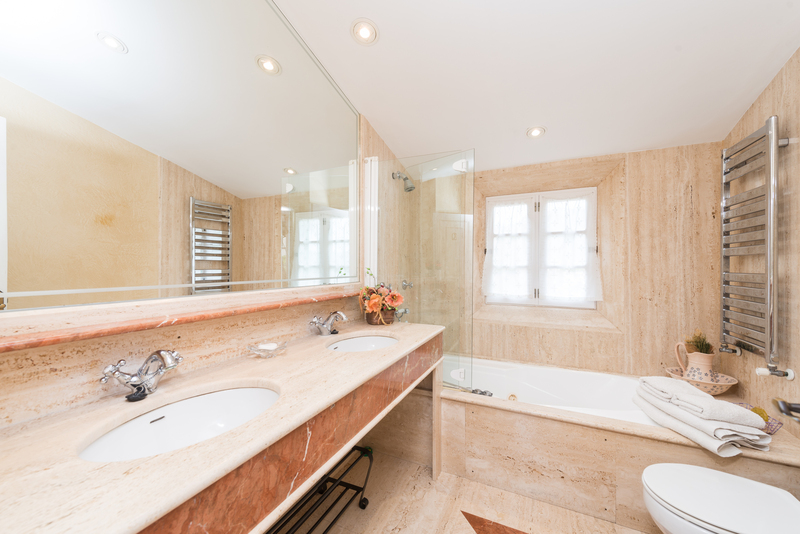 This fabulous home caters for both seasons, as it is equipped with A/C in the sitting room, the dining area and all three bedrooms for the summer and central heating for the colder months. 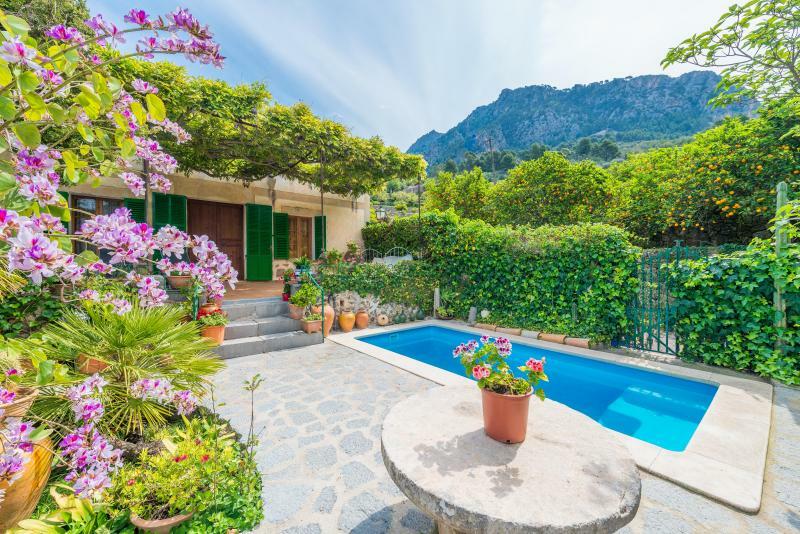 Located in the village of Biniaraix, at the foot of the mountains, this home has a few direct neighbours. Biniaraix is a good starting point for many hiking excursions, like the trails to Cuber or Coll de Ofre. A hiking trip through the mountains is a gorgeous idea to get to know the quiet side of Mallorca. 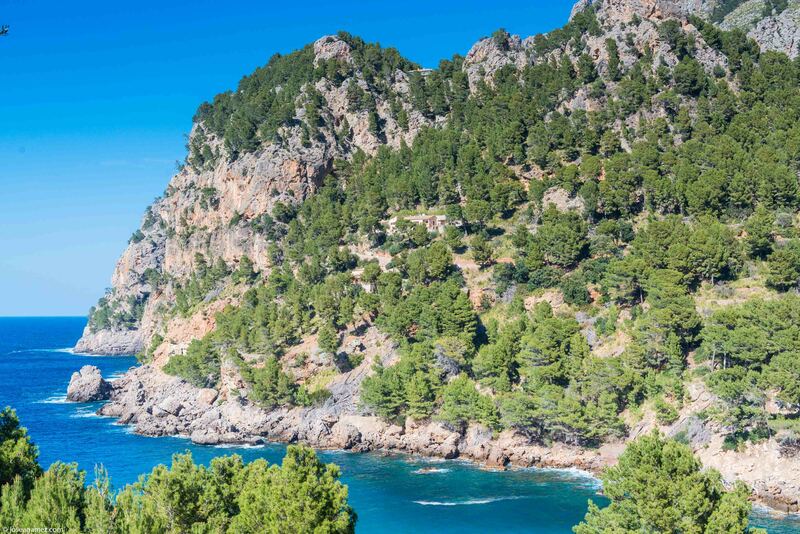 If the beach is what you are searching for, you could go to Puerto de Sóller. Furthermore, hidden in the midst of the mountains, there are lots of small gravel bays: Port des Canonge, Llucalcari, Cala Deià and the famous Sa Calobra, just to mention a few. 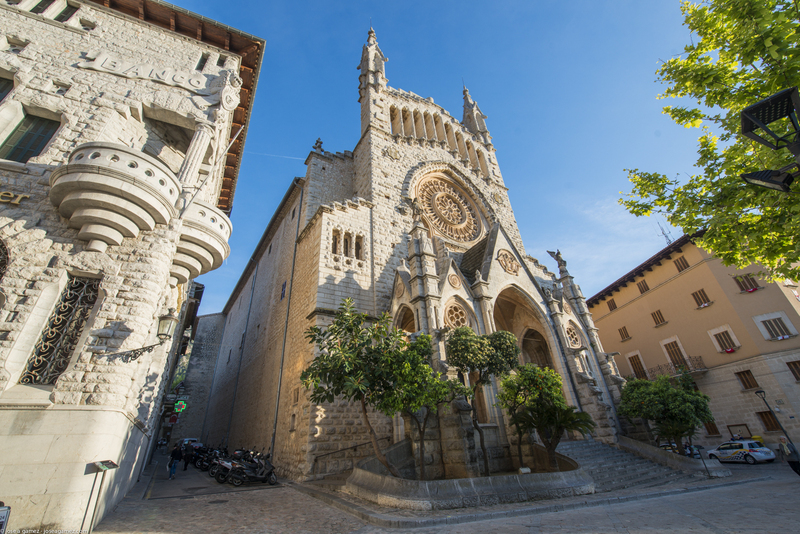 A 20 minutes' drive takes you to Sóller, famous for its baroque church on the main square. 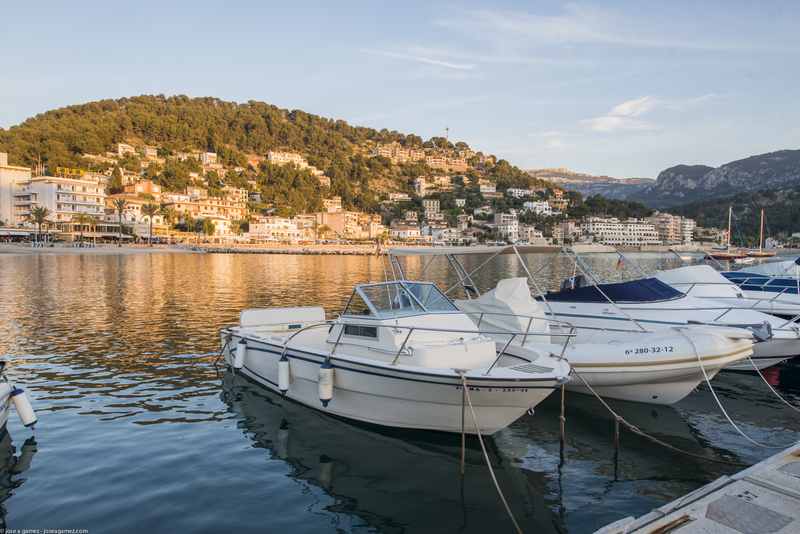 By tram you could go to Puerto de Sóller with its sand beach, restaurants and shops. Furthermore, there is an antique train starting from Sóller towards Palma, past lush green valleys, imposing mountains and picturesque villages. However a car is necessary. There is outdoor parking space for 1 car. 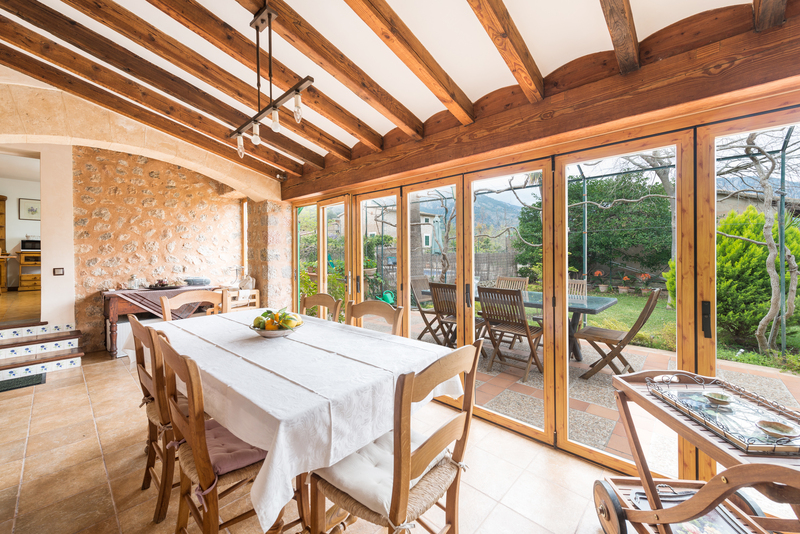 Lovely family home with Spanish character in a stunning setting. Host was very helpful. Swimming pool was perfect for our 4 kids. We had a great time here, the house was spotless and had everything you could possibly need. The pool was lively and the pictures were completely accurate. All I would say is that a wee handbook with instructions on a few things would have been useful. For example we couldn't find the light switch for the outside lights and so couldn't turn them off (until a gardener did but without showing us where the switch was!) Other than that it was great and really good value for money :) thank you very much. The gadgets in the kitchen (Nespresso machine!) Garden, pool, slide for kids a few toys! Just a little explanation of where everything was would have been good but otherwise no issues. Just a little explanation of where everything was would have been good but otherwise no issues. The entrance to the house is down a tiny lane that the google maps doesn't take you to. It would be useful to have written directions as well. We wanted to say thank you for a very good service from you, and the house was fantastic. I thought I should mention to you, two things for you or the owner. 1. The house needs a small booklet to give a basic map of the local roads for walking to town and around the area, and to explain the house systems including the heating, hot water and lighting. - so many light switches for outside!. Beautiful older house in amazing location. 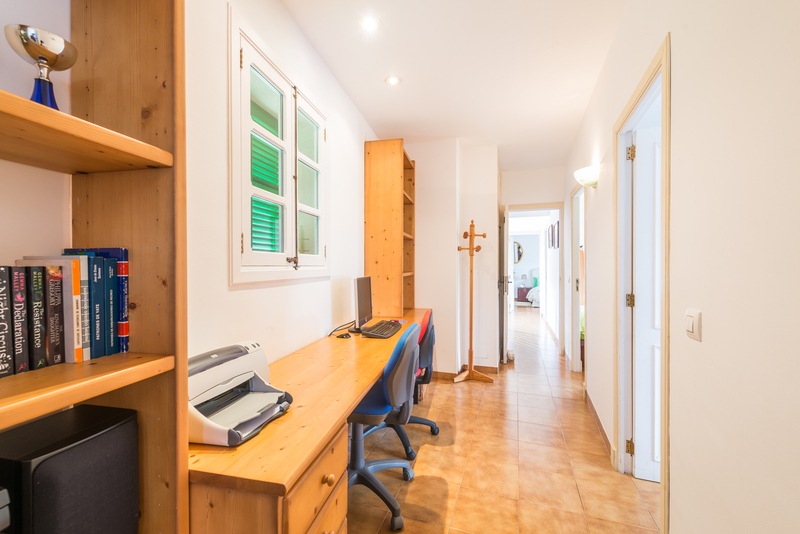 The house has three lovely bedrooms, all very comfortable beds, with wardrobe and storage space. Showers good. 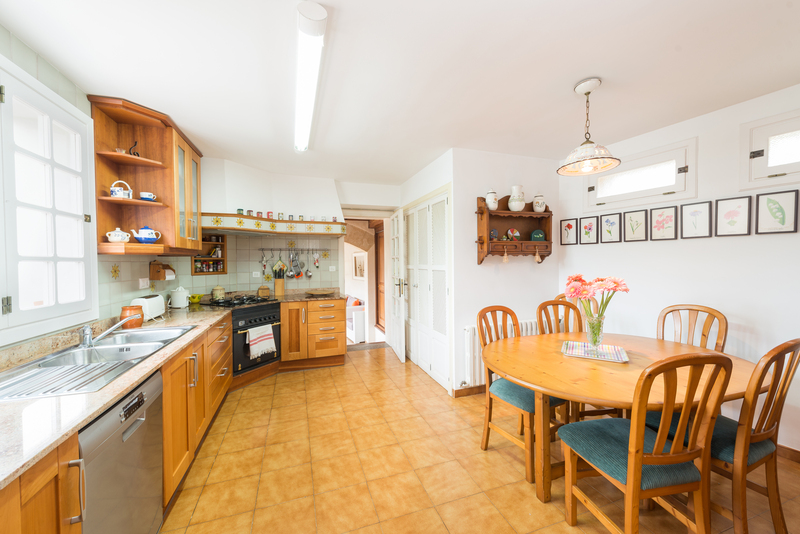 The lounge is large and comfortable, a spacious well equipped kitchen and conservatory too for cooking and eating. Plenty of space outside to sit together to eat and relax day and night with three areas of seating, and sunloungers next to an enclosed pool area, (useful for families with small children).We used the pool, rather chilly in April, but great for cooling off. It will be fantastic in the summer.The garden pretty and well kept, with a little orchard too. Its a small lane to drive down, so a smaller car is better, but the electronic gateway allows easy access. (be aware, the house name is different from the trip advisor title). It is situated close to Biniaraix, which has a great little cafe and is the start of the Barranc de Biniaraix, an adventurous walking trail up into the mountains, wonderful views! We loved Ecovinyassa, the wonderful little organic citrus farm around the corner. 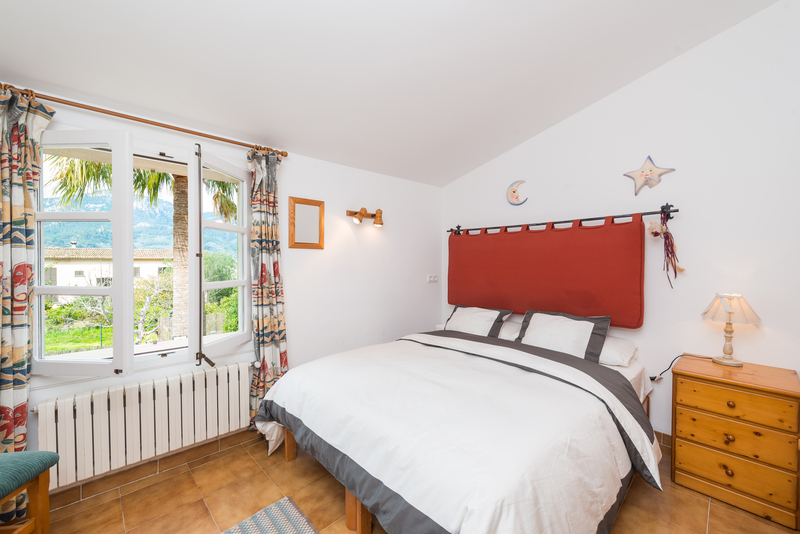 The house is an enjoyable 20 minute walk from the lovely town of Soller, (plenty of cafes there) with the incredible Tramuntana mountains behind the house lit up by the sunset, and the scent of orange blossom all around, you cannot want for a more relaxing and happy time.The owner was very helpful with our queries, and we really appreciated the welcome baskets including their own grown oranges, lemons and grapefruits! (like no other!) We suggest a small booklet of information to help visitors- basic map, house info etc, but any enquiry was responded to quickly. Many thanks, wonderful! The house is great: quiet, good quality, spacious. Great place to stay! 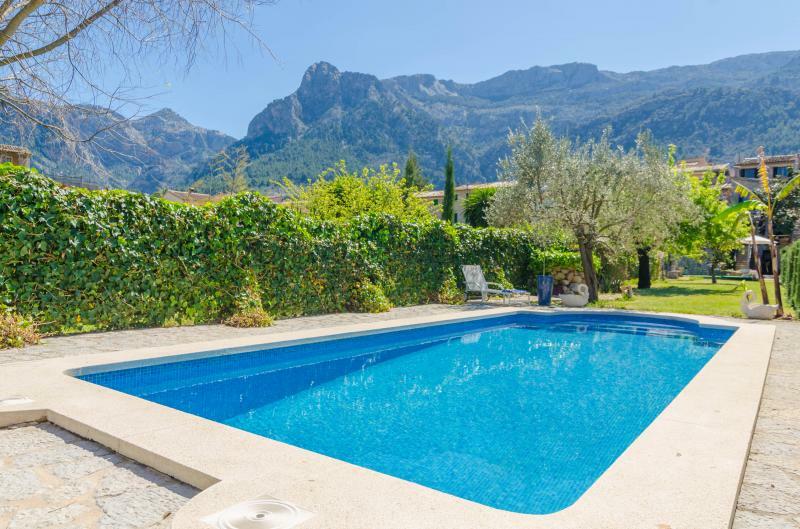 Wonderful house with luxury rooms, complete kitchen, private garage, beautiful garden, nice and clean swimming pool, great view on the mountains. The house is great, quiet, good quality, spacious, very nice pool, all rooms and kitchen were clean and nice.